The gluten free shopper is finding more and more good things in the aisles at Sainsburys. I have already reported on the expanded product range in the main Free From aisle and the great new packaging. Now Sainsbury’s has pulled together an excellent chiller aisle which has an expanded product range including ready meals, fresh pizza, pasta, quiches and pies. For those seeking dairy free there is also a range of cheeses. The freezer choice has also expanded and there are some great Genius sausage rolls included in the selection. I recently tried a few items and my gluten-eating teenager’s comment on all three tasters was: “what’s the difference?” – so that is a good thumbs up for Sainsbury’s! 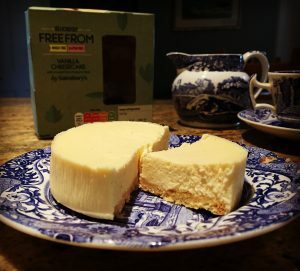 So we tried the Sainsbury’s cheesecake – a light and moist cake that could do with a more robust base, but otherwise is a good pudding option. 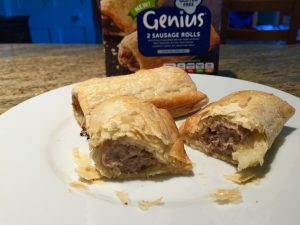 The other discoveries were the Genius sausage rolls, which you cook from frozen and they are crumbly and light and really tasty; and the No-G pork pie, which has exceptional pastry and a great meaty filling. I am always interested to hear of other recommendations and it has not passed my notice that increasing numbers of Sainsbury’s TTD sausages are gluten free. Things are really looking up!